I can appreciate the history of V-Day and that it's meant to show love to the ones we care about, but I would prefer we did that more than 1 day a year. So I'm not that into Valentine's Day... and no, I'm not single, though single people have good reason to hate it anyway. I don't need flowers or fancy dinners or gifts. I want the one thing you can't purchase, get back or return... time. I just want to spend time with the person I care about most, my husband. So tonight, rather than doing our usual routine of being in the same house but in different rooms, we will lock the door and simply spend time together. It's the best and only gift I want this year. 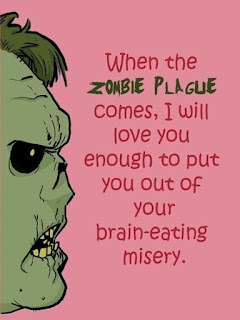 And for those of us who prefer humor to romance, click the picture below to see some awesome V-Day cards.